here's a problem with the new Robocop costume/suit: The main issue I have with it is that it looks like a suit of armor. The original Robocop didn't look like a guy wearing a suit it looked like a half man/half robot cyborg. There is nothing memorable about it. This is just a Mass Effect, Dark Knight, Iron Man, G.I. 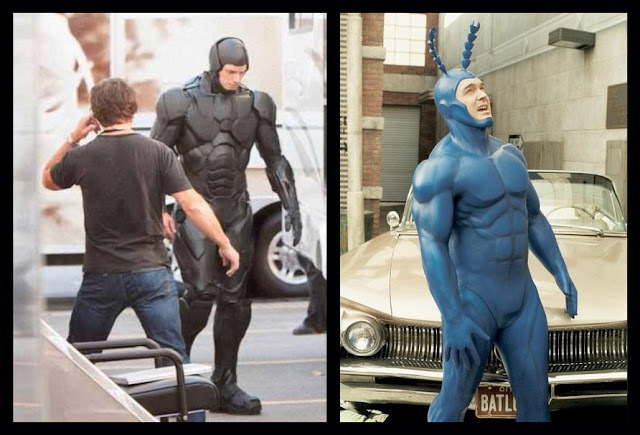 Joe ripoff that will either be forgotten after the 2013 movie season or laughed at for years to come. RoboCop is an upcoming remake of the 1987 film of the same name. It will be directed by José Padilha. The idea of a RoboCop remake or "re-imagining" has been in development hell for many years. Robocop remake will be released in summer 2013: August 9, 2013. The film has a budget of 100 million dollars according to imdb.com and is written by Nick Schenk (Gran Torino) and Joshua Zetumer. Joel Kinnaman, star of the series The Killing, landed the lead role, Alex Murphy in the next remake of Robocop. Other stars include Michael K. Williams as Jack Lewis, Abbie Cornish as Ellen Murphy, Gary Oldman as Norton, Michael Keaton as Raymond Sellars, Samuel L. Jackson as Pat Novak, Jackie Earle Haley as Maddox, Marianne Jean-Baptiste as Chief Karen Dean and Jay Baruchel as marketing director at OmniCorp.